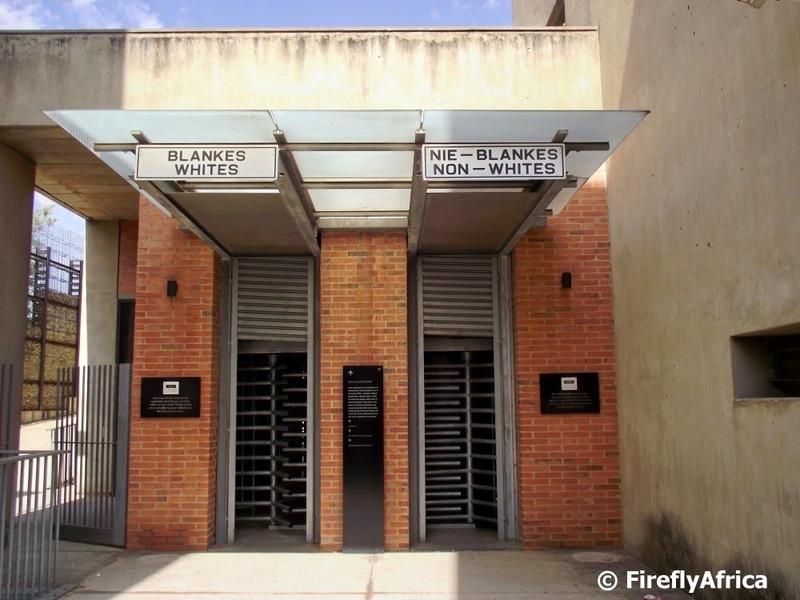 The Apartheid era is a part of the South African history that will never go away. It shaped South Africa's past and future to what it is today and the results of it will be seen for generations to come. Even though it isn't something that should be celebrated it is something that must be remembered to make sure such things will never happen again. Ja, ja, I can already hear comments about some of the situations we find ourselves in today, but that isn't what this post is about. 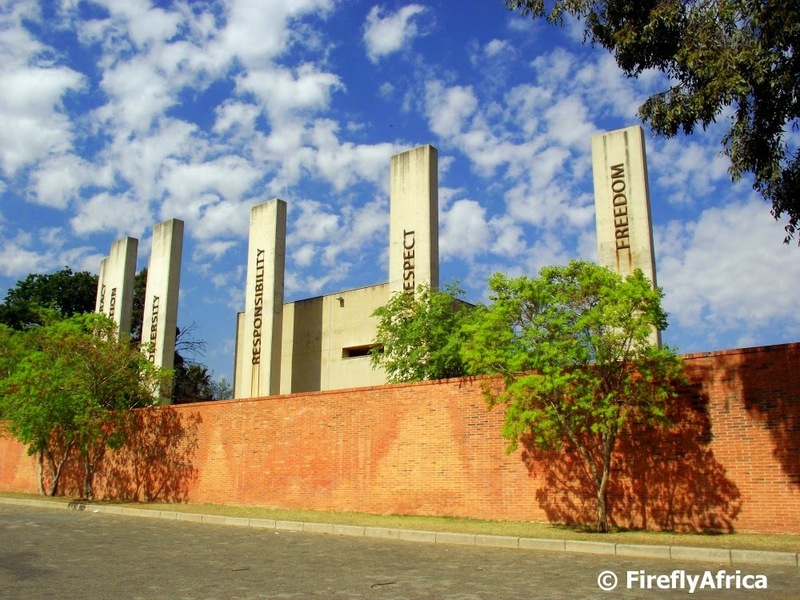 This post is about the Apartheid Museum next to Gold Reef City in Johannesburg. I have always wanted visit the museum and that opportunity presented itself to me late last year while I was in Jozi for the Lilizela Awards. 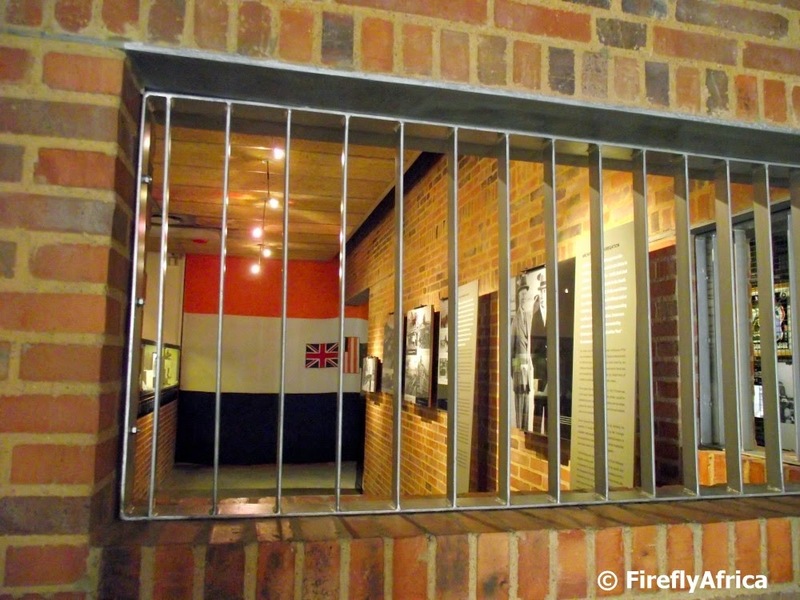 I have to be honest when I say it probably isn't everybody's cup of tea, but it does tell the story of Apartheid in detail and is of particular interest to anybody who would like to learn more about the country's history. This is probably also where the biggest problem in the museum lies. They are trying to convey too much information which means you could be in there for literally hours trying to read all the info throughout the exhibits. I would have liked to see more interactive and visual representation and less writing, but what is there and gets conveyed has a very powerful and moving message. My intention isn't for this post to contain anywhere close to the same amount of writing but to rather be more of a photographic tour. 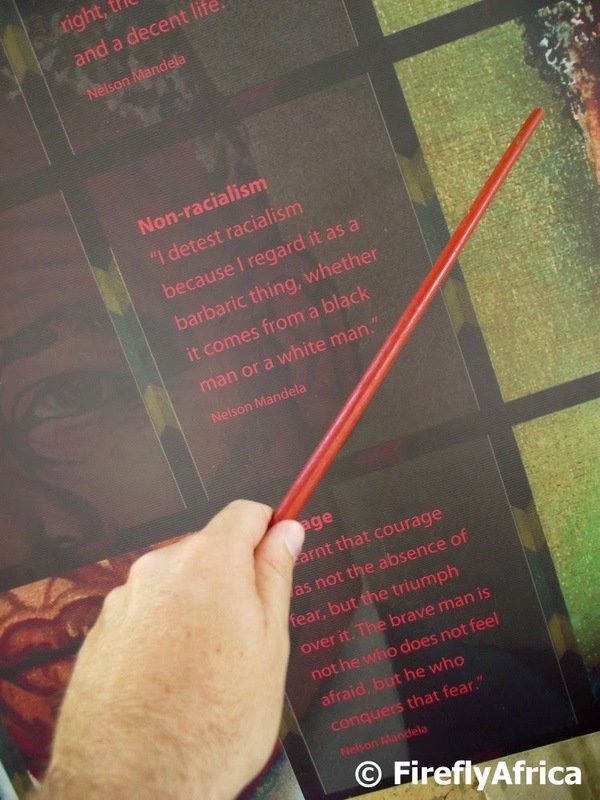 I was hugely impressed with the exhibition celebrating the life of Nelson Mandela. I realize that the Apartheid struggle was so much more and bigger than Madiba himself, but he is the one who shaped the transition into a new democratic South Africa peacefully and deserves all the credit he is given as such. Plus even though us South Africans may sometimes feel a bit of a Mandela overload, that is what international visitors want to see. 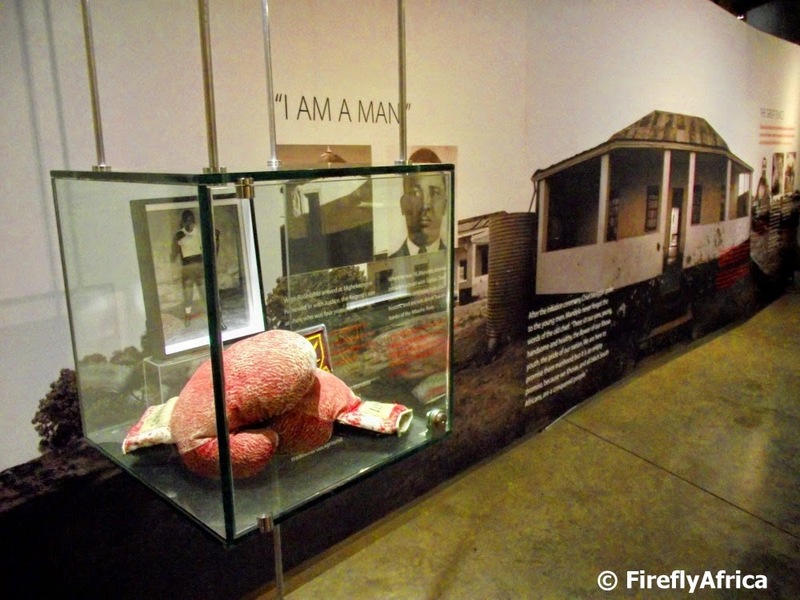 The Mandela exhibit contains not just a lot of information on Madiba's life but also photos and artifacts like his boxing gloves in the above picture. 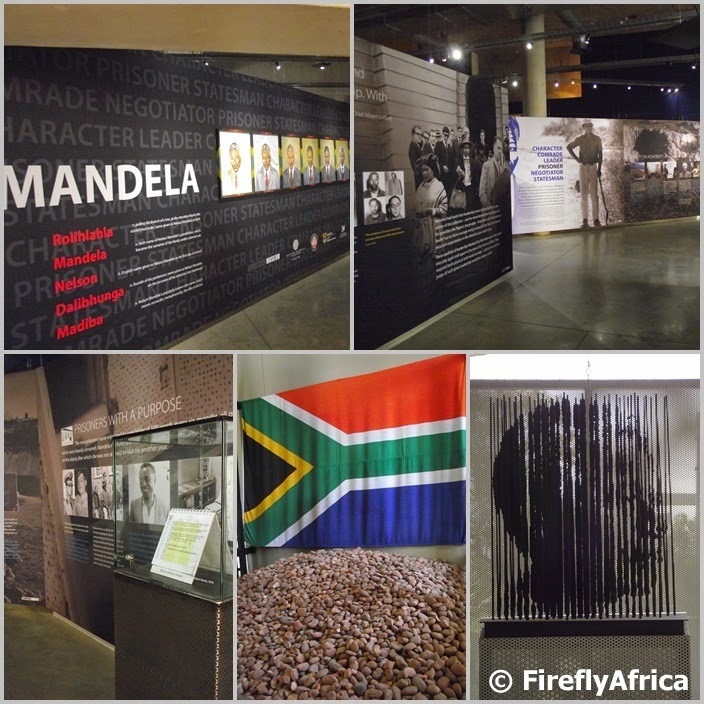 The Mandela Museum in Mthatha contains a lot of artifacts pertaining to his life and I would really have liked to see this exhibition having more of that as well, but what they had did had visitors glued to the exhibition. 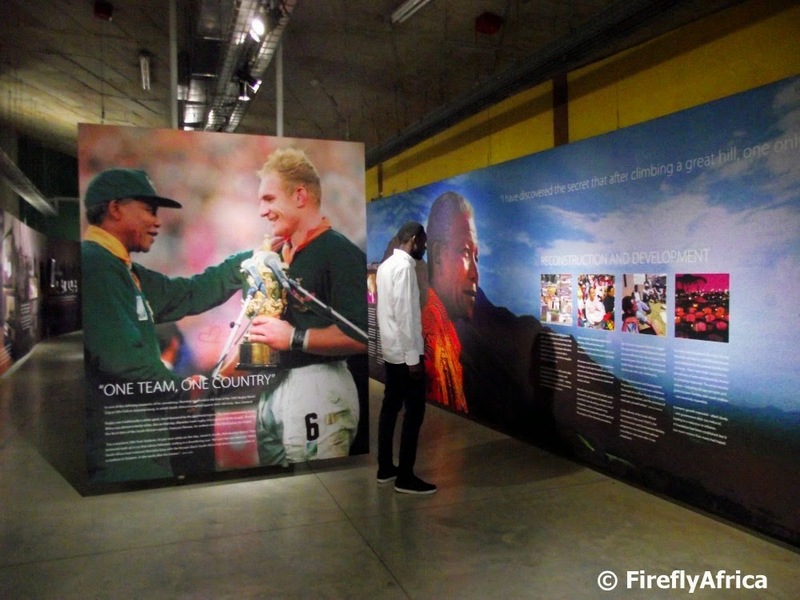 Photographs are not ordinarily allowed in the museum but I was very fortunate that my visit was organized by Gauteng Tourism and I received media accreditation on my arrival allowing me to take photos. The guy in the photograph is an security guard who saw my camera and very politely reminded me that photographs weren't allowed. I showed him the accreditation card I was given and immediately told him that I wanted to take a picture and needed a human subject in it. As there was nobody else around at that stage I roped him in and after some directing I got the pic I wanted. man or a white man." I made sure I got to the museum just after opening time so that I could make my way through before the crowds arrived. As a South African I know most of the history of the Apartheid era so I didn't spend that much time reading through the info. I rather made sure that I got to see all the other exhibits and try to get photos of it before to many people arrived. 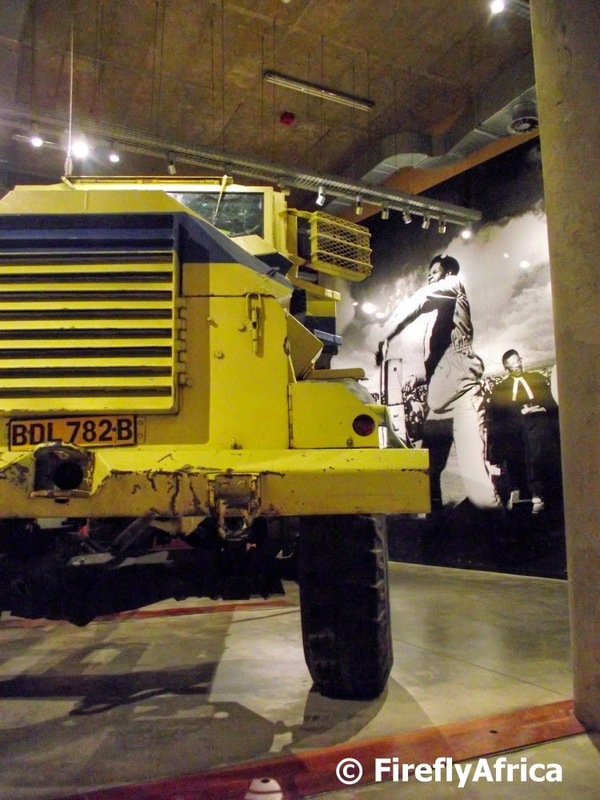 One of the most striking visual parts of the exhibition for me was a Police Casspir which formed part of an exhibit on the 1976 student uprising. Imagine one of these coming at you. I don't want to end off the post with the usual "I really would like to encourage everybody to try and visit the museum at least once" because it gets a little cliché but, you know what, I would really like to encourage everybody to visit the museum at least once. It contains a wealth of information and history, which could be a slight information overload if you overdo it, but I promise you that even if you think you knew it all you will still learn something or at least be moved in some way. Disclosure: I was in Johannesburg as a guest of the Tourism Grading Council of South Africa as one of the judges of the Lilizela Tourism Awards. 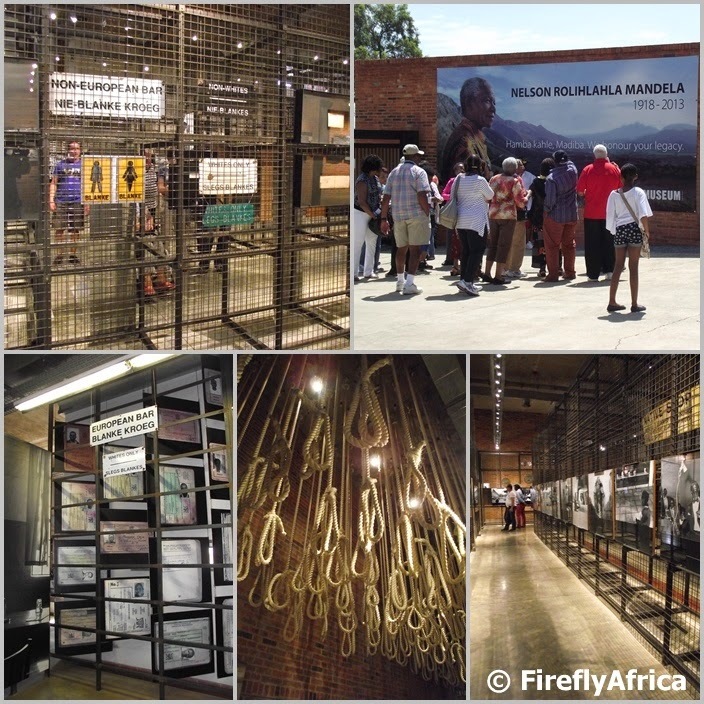 My visit to the Apartheid Museum was organized by Gauteng Tourism. I received no further remuneration and keep full editorial control over the post. 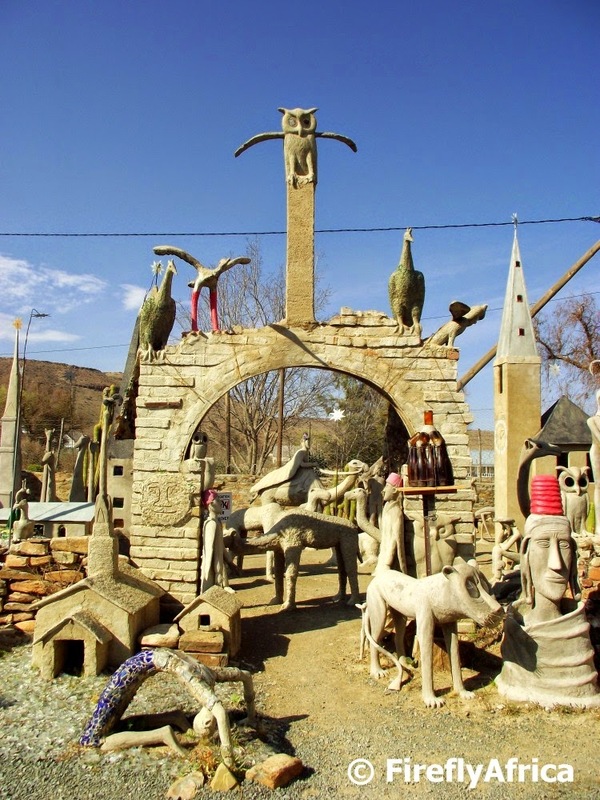 The Karoo Town of Nieu Bethesda is the kind of place everybody needs to try and visit at some stage in their lives. Its not a big tourist orientated city but rather a small village that embrace their visitors. The most famous attraction in Nieu Bethesda is the world renown Owl House. The late Helen Martins spent most of her life in the town and the latter part of it transforming her ordinary Karoo home into a place of colour and light. Over the years she and her assistant Koos Malgas, used concrete and glass to create a multi-coloured house and fantasy garden. In the Camel Yard visitors will find statues of owls, camels, wise men and much more and one can literally get lost In your own thoughts trying to take all of this in. Shortly before her 79th birthday, Helen Martins committed suicide by drinking caustic soda. It is said that at the time her eyesight was failing because of damage from ground glass and that depression was getting the better of her. At present the Owl House is open from 8 a.m. to 6 p.m. daily in summer and from 9 a.m. to 5 p.m. during winter. Entry is R50 per person for both adults and kids and R65 for a combo ticket for the Owl House and the nearby Kitching Fossil Centre. Visiting a cucumber farm probably isn't very high on anybody's list when you talk agritourism, but I'm always up for something new. I was in the Gamtoos Valley as part of a media tour recently and Gamtoos Tourism organized for us to visit Malan Cucumbers. This isn't a technical post so I just want to tell you about the experience. We were met by the farmer and his daughter who took us on a walk around the facilities situated just outside Patensie. The first thing we got to see was the growing tunnels. The cucumbers are grown in tunnels as they grow best in a hot environment and the tunnels don't just keep it warm but also protects the plants. The cucumber plants themselves aren't grown in the earth but in bags with a special soil mix. It's also amazing to hear how quickly the actual cucumber grows when the conditions are right, up to several centimeters a day. Next up was a visit to the packhouse. We arrived a bit late so most of the staff knocked off for the day already although a few were packing the last few vegies for the day in crates. 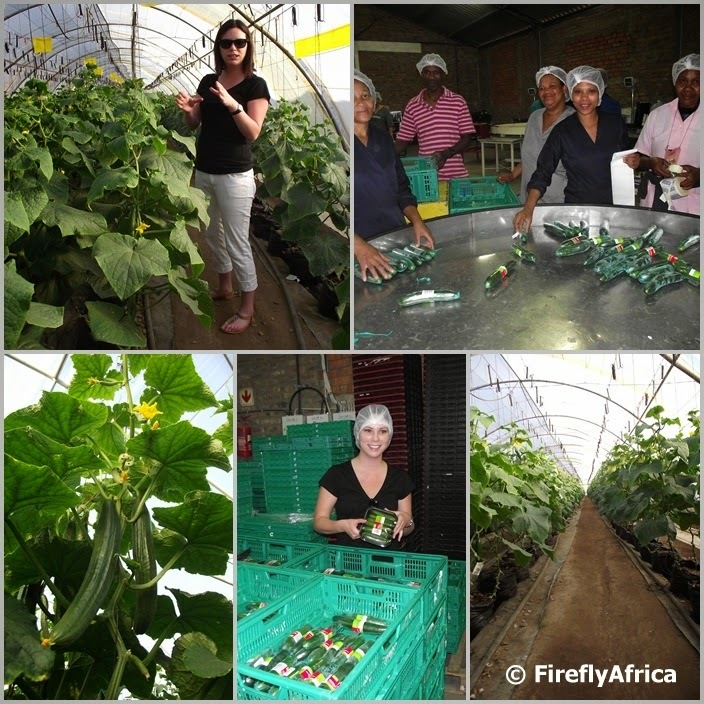 The cucumbers come straight out the tunnels into the packhouse to be sorted and packaged. The cucumbers are then individually wrapped in plastic while the gherkins get packaged in punnets. The labels of the different supermarkets that carry their products get put on right here on the farm already so the cold storage trucks deliver them directly to the shop and onto the shelves. Spending 30 minutes or so on a farm like this makes you appreciate what goes on behind the scenes and you realize how little you know about where the fruit and vegies in the supermarket comes from. Gives you more appreciation of what you eat next time you have that humble green salad. If there is an area I'm definitely planning to get to know better then it's the Wild Coast. 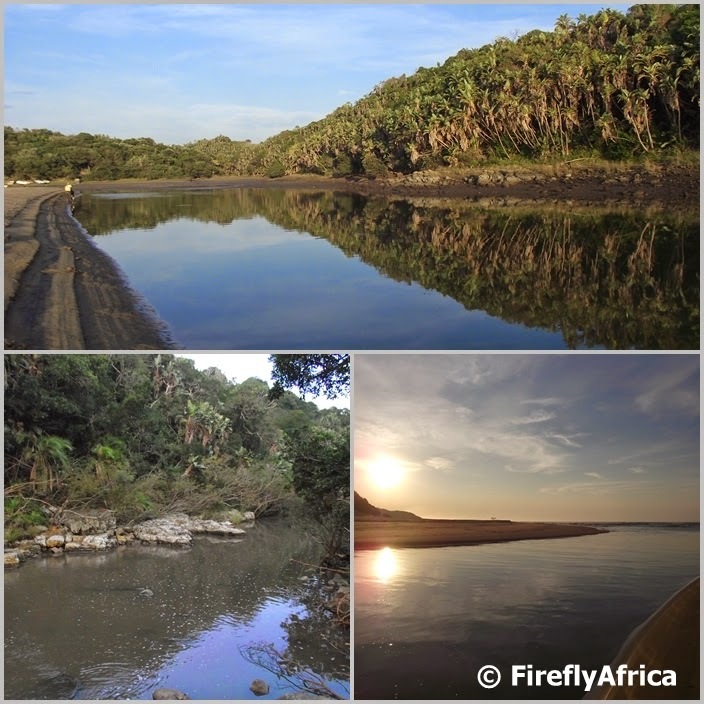 Earlier in the year while on a roadtrip to Durban, I spent a night at Trennerys Hotel at the mouth of the Qolora River, not far north of the Great Kei River Mouth. 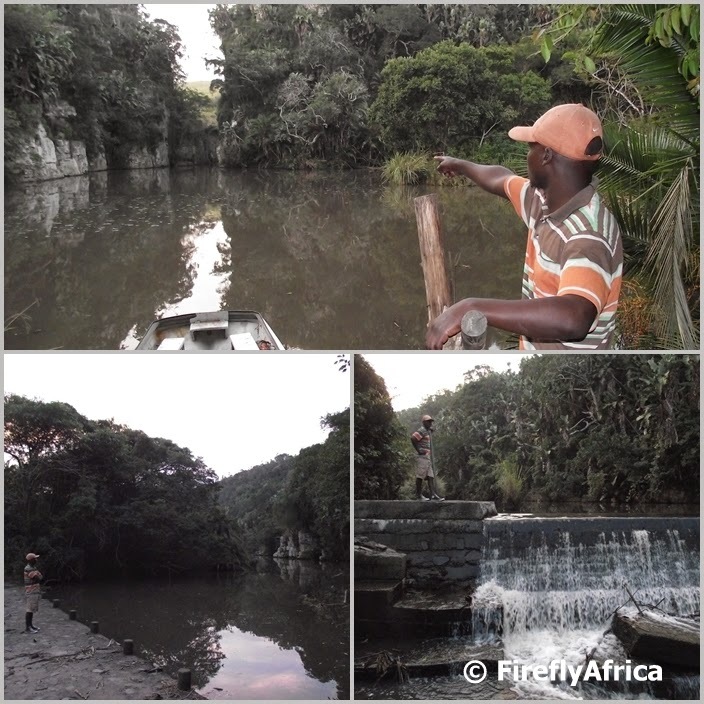 As I pulled in fairly latish in the afternoon, it meant that I had limited time to explore before sunset and had to make a choice between heading down the coast towards the famous wreck of the Jacaranda or inland to The Gates on the Qolora River. These are two of the main attractions in the area but more importantly for me, there is a Geocache at each location and I couldn't leave without finding at least one. After getting some more info from the hotel staff I decided that the walk to the Jacaranda may just be a tad to far for the time on hand. The Gates it was then. But how to get there if you don't book a tour with Trevor's Tours starting at the hotel? Again I chatted to hotel staff who advised me that if I really wanted to go there I should park up the road at the village and walk along the dirt road across from the little shop there. Arriving at the village I was immediately mobbed by a group of kids looking for sweets. A young man called Lizo (sorry but I think that was what he said. I seem to have misplaced my notes I took while chatting to him) came to my rescue - not that I really need to be rescued from a bunch of kids. After chasing them off he asked me what I was looking for. I told him I wanted to go to The Gates. He cocked his head and asked, "Why?" I explained that I wanted to go and see what it looked like and take some photos. "Why," he asked again. This time I explained that I have a travel website and that I wanted to post about it on there. He still looked at me funny and suddenly said that he would take me. That was kinda unexpected and afterwards somebody asked me if I wasn't scared that he would rob me or something. I just felt like I could trust him. After asking me to park my car in front of his grandmother's house, we headed down the two track road full of holes and dongas on foot (there was no way my car was going to navigate that) and down into the forest around the river. Lizo told me about the area, the river, the village and it's people and about himself. He is unemployed and came back to the village after finishing school in Cape Town. He actually worked for Trevor's Tours at some stage and really wanted to do guiding in the area again to take people to The Gates and the Jacaranda. Once down by the river he pointed out The Gates and some of the other interesting formations. The Gates is a narrow gorge with steep cliffs rising on either side (the remnants of a geological fault and water erosion). The water at The Gates is said to be 7m deep. From here he took me downstream a bit to the weir from where water gets pumped and a low water bridge. As you can see in the photos the light was unfortunately fading fast and I wanted to get back to the car before dark. When we got back to the village Lizo wished me well for the rest of my travels. He didn't try to solicit a tip from me (which so many official tour guides often do) but I decided to give him something for his effort anyway. He truly deserved it and without him I would probably have gotten lost and stuck down there in the dark. I wish there was more people like him around willing to go out their way for visitors even if they don't work in the tourism industry. Ahh, the Tsitsikamma..... My favorite Sho't Left destination for a couple of days' breakaway. Beautiful indigenous forests to sooth my soul, mountains on the horizon, streams running past ancient indigenous trees and forest giants to a rugged coastline where the blue ocean crashes as white waves on black rocks at the foot of sheer cliffs. This part of the Garden Route must be one of the most beautiful places in South Africa. Truly paradise. The Tsitsikamma is a lot more than natural beauty and scenery though. Its also a place of activities and adventures, some adrenalin filled and others a lot more relaxing. I am fortunate that I work in the travel industry and the Tsitsikamma is one of the areas that I get to visit quite often both for work and play. I decided to compile a list of 10 activities, restaurants and accommodation establishment (in no particular order) that I got to visit in 2014 and that is not to be missed. Not that there isn't more, because there is. It's just that I have had first hand experience of these. I have a very special place in my heart and soul for an indigenous. It's somewhere I can go to unwind. Somewhere I can sit in silence and allow all my problems to flow away from me, even if its just for a short time. I like to go for a walk on any of the short trails through the forest around Stormsriver Village, but there is another way to explore it and learn at the same time. 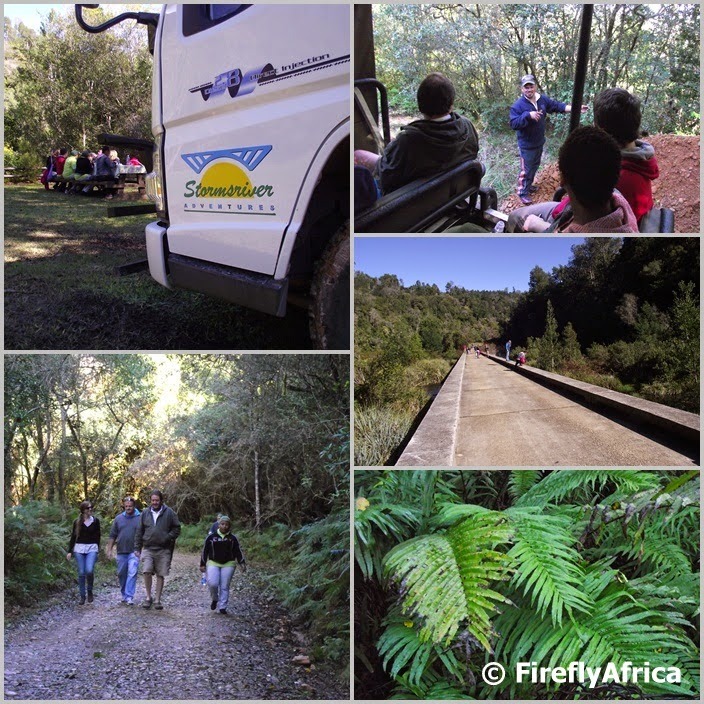 The Woodcutters Journey is a guided tour down the old Storms River Pass is a specially designed vehicle. The pass follows the old elephant migratory route down to the river and on the way passes tree ferns, stinkwoods, yellow woods and many other tree species. The guide tells you more about the history of the area while pointing out the local flora and fauna. At the bottom of the pass the tour takes a break next to the river for a light lunch or tea and cake. This is the ideal tour for older visitors or those who would like to learn more about the ins and outs of the forest. How about gliding through the indigenous forest like the elusive Knysna Loerie? Experience the forest from above. 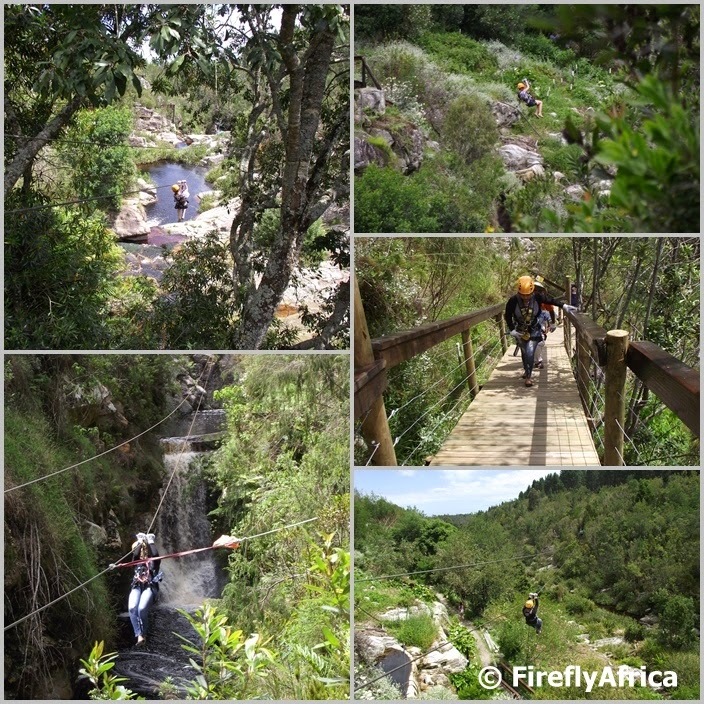 The Tsitsikamma Canopy Tour has become a iconic activity in the area and consists of 10 platforms and 10 zipline slides. The tour takes about three hours and is more than just an adrenalin rush. The guides aren't just adventure guides, they also tell you more about the forest and what you see along the way. I had the great opportunity to do a Canopy Tour with the family and it was something the KidZ have been talking about over and over. Something I won't forget quickly was getting ready to push off one of the platforms 30 meters up when suddenly two Knysna Loeries swooped up from below and took the lead for me to follow. An experience you won't forget that quickly. One of my absolute favorite activities in the area is the Tsitsikamma Segway Tour. A Segway is a personal transporter that is easy to handle and another perfect way to experience the forest. You start off with a 15-20 minute training session on their training course where the guides make sure you know exactly how to handle your Segway safely before setting off. 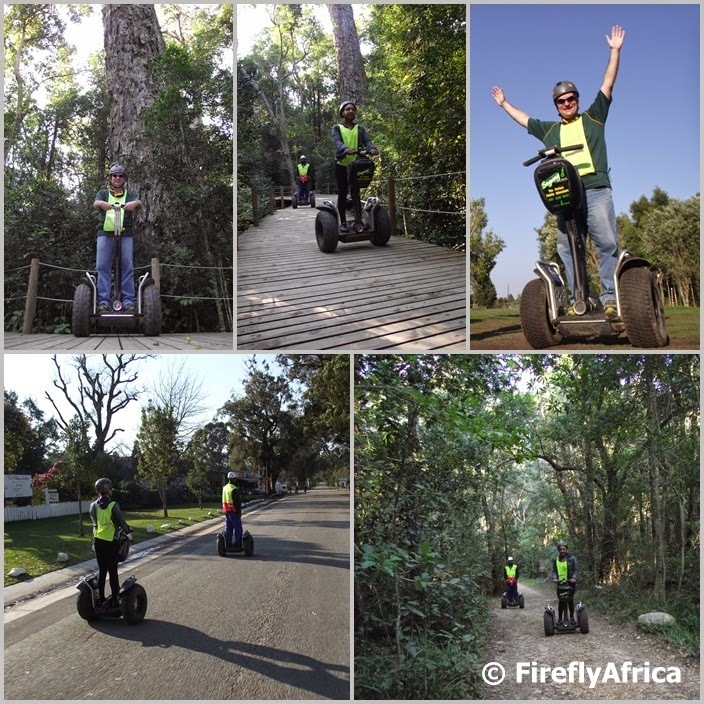 The 1 hour Segway experience takes you on a journey through the quaint Stormsriver Village and follow one of a selection of routes among cool pine forest, the indigenous forest, or to the historical Witteklip bridge. It also takes you through the local township. The 2 hour tour, the one I went on, goes through Stormsriver Village, and into the cool pine forests. From here we entered the ancient indigenous Tsitsikamma Forests and made our way along the paths to the famous and majestic 1000 year old Tsitsikamma Big Tree and back to the village. Once you do it, I promise you won't want to stop. How about flying over a river gorge, across a waterfall and along the river itself? You can do it at Tsitsikamma Falls Adventures. The experience includes eight slides of which the longest is 211m. It zigzags across the river gorge, sometimes as high as 50m above the water. Because its open and you aren't amongst the trees, you get a better idea of height which gives you the opportunity to really take in the views and your surroundings as you go along. Tsitsikamma Falls Adventures is situated on the N2 about 10 minutes east of Storms River Bridge and takes about an hour and a half which is ideal if you haven't got that much time in the area. 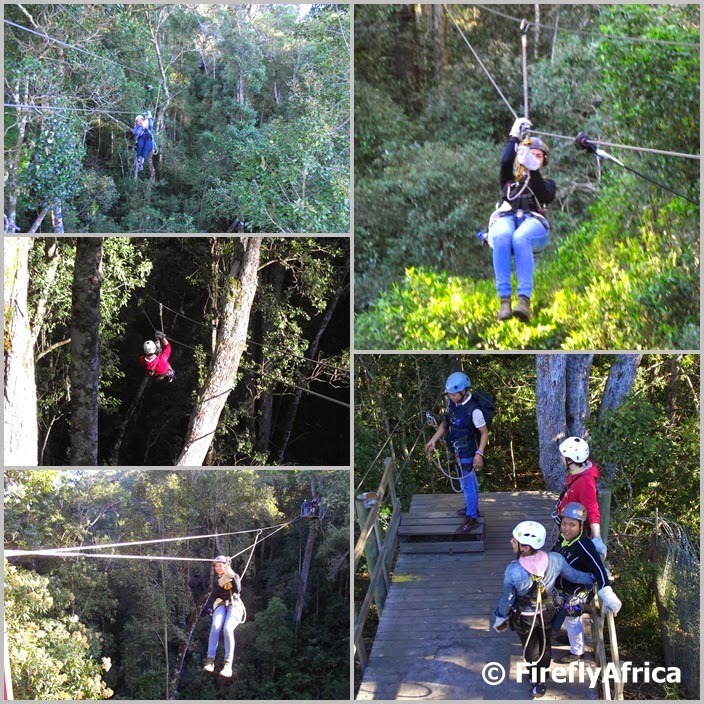 Because I have done both Tsitsikamma Falls zipline and the Tsitsikamma Canopy Tour, I have had a lot of people ask me which one is better. It's really impossible to say because other than the fact that they are both guided zipline experiences, they don't have much else in common. They use different zipline "setups", the one is a full on tour while the other is more seen as an adrenalin activity, one takes it easy which is more time consuming while the other is a much shorter experience, one involves the forest and the other a river gorge and so I can go on. It really depends on what you want and what experience you're looking to have. If you have the time and your budget allows, I would say you have to do and experience both. 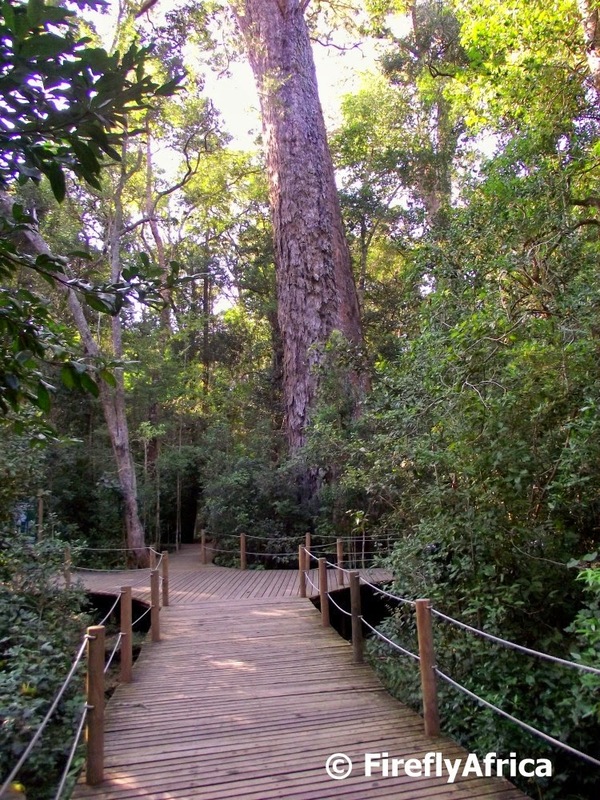 The Big Tree is as part of the Tsitsikamma as the Tsitsikamma National Park down on the coast is. Probably the second most visited spot in the area by tour groups (don't go and quote me on that now). The forest around this 1000 years old tree (I'm sure when I was still guiding 7 years ago the signs still said 800 years) forms part of the Tsitsikamma National Park which now is a sub section of the Garden Route National Park. The Big Tree is a great leg stretch stop if you are just passing through or something to go and do early morning or in the afternoon to take your mind off all the other things you can do in the area. From the parking area it's a nice easy 500 meter walk along a boardwalk to the tree. Americans seem to be disappointed when they get there, but it is because they are used to Redwood Trees back home. She is a biggie though and stand 36.6 meters tall with a circumference of nearly nine meters and a canopy spread of about 33 meters. Did you know that the biggest commercial protea farm in the world can be found in the Tsitsikamma? No? Well it is. About 8 or so years ago I used to visit the farm on specially organized tours with British tourists, but Dewald Niemann of Oudebosch Farmstall now offers groups regular tours to the farm. During a visit you don't just get to see the proteas growing in the fields, but also how they pick, sort and pack them for export. The warehouse isn't that big, but it's an amazing sight walking into the cold storeroom and seeing the whole place full of flowers waiting to be shipped out. 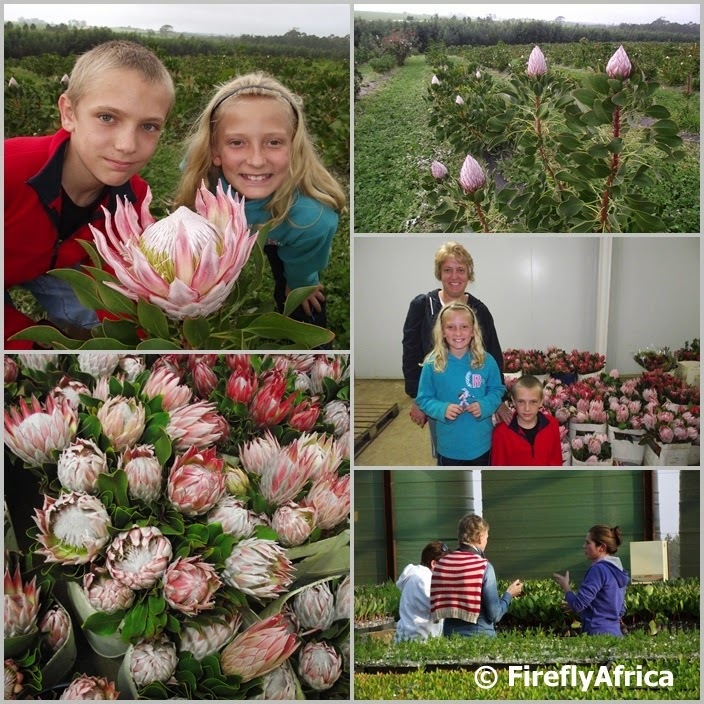 The tour also includes the protea nursery where Hanli Viljoen may just take you around to show off all her babies. This is another of the activities in the area that I got to share with my family this year. Bookings can be made through Oudebosch Farmstall and there are minimum numbers so give them a call in advance to check if there is a tour going. I'm combining #7 and #8 in one heading as they are both restaurants. Visiting the village of Stormsrivier, you would never expect to find a place like Marilyn's 60's Diner there. It's all neon and chrome with lots and lots of Elvis, Marilyn Monroe and 60's memorabilia. This is also where you would find the annual Elvis Festival Africa. Very cool indeed. Marilyn's is great for a burger and chips lunch stop, because burgers and chips is what you eat at a place like this. Their milkshakes also go down like a dream after a walk in the forest while a midmorning coffee between activities is also an option. Right next door there's also a new micro brewery, but that I'll keep for next time after I have had a chance to try it out. One of the most popular stops in the area is Oudebosch Farmstall on the eastern side of the Tsitsikamma. 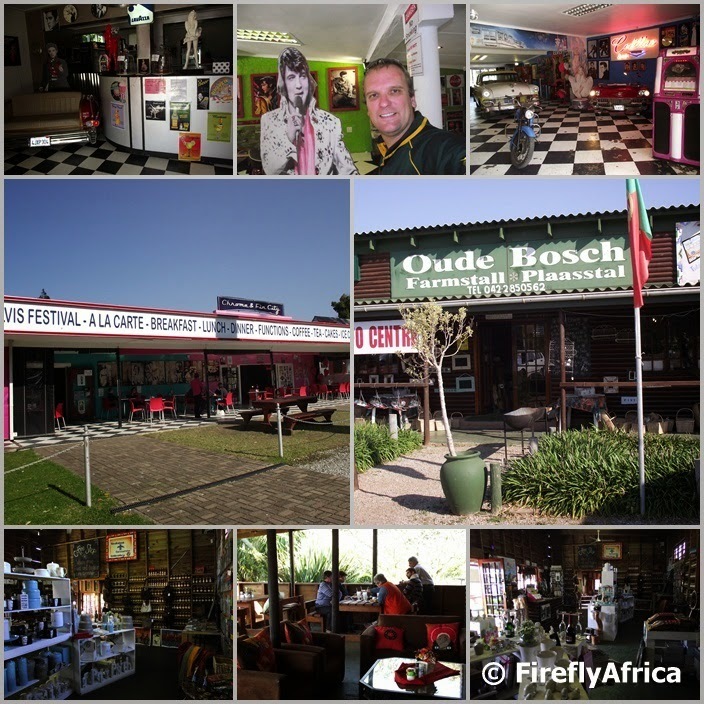 Oudebosch is more than just a regular farmstall. It has three main components to it. 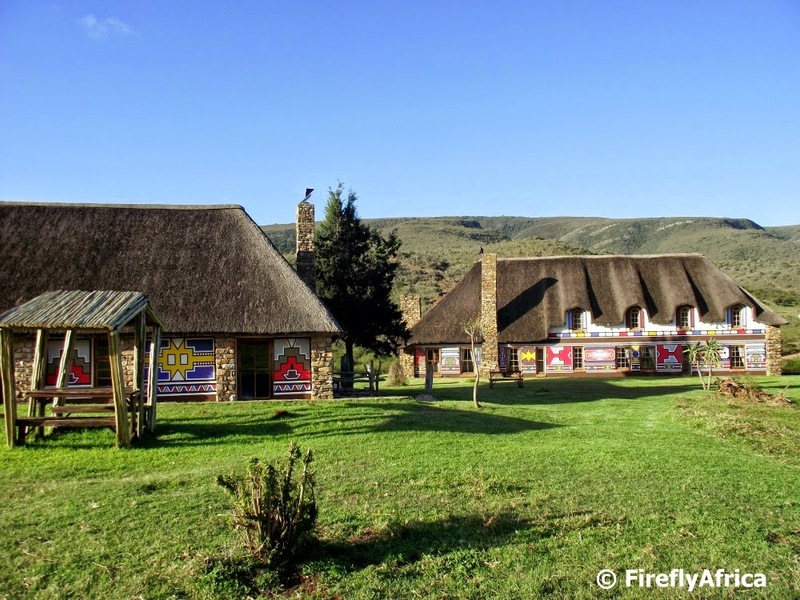 There is the supermarket servicing the surrounding farming community and tourists heading to Eersterivier and a curio shop where you will find mostly South African crafts and gifts. The main reason people stop here though is the restaurant / coffee shop. Oudebosch has a full lunch menu which is very popular but they are truly famous for their mouth watering roosterkoek made right there in the restaurant on the coals. The Tsitsikamma is truly blessed with a wide range of excellent accommodation establishments starting with camping and self catering in the Tsitsikamma National Park to backpackers hostels, B&B's, guesthouses and hotels. 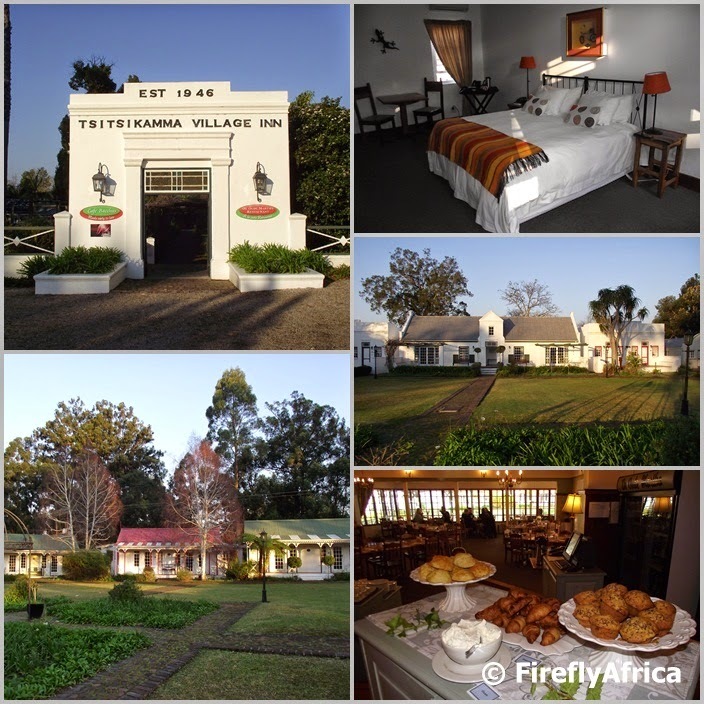 My favorite place to stay is the Tsitsikamma Village Inn, right in the heart of Stormsriver Village, where the main building dates back to 1845. 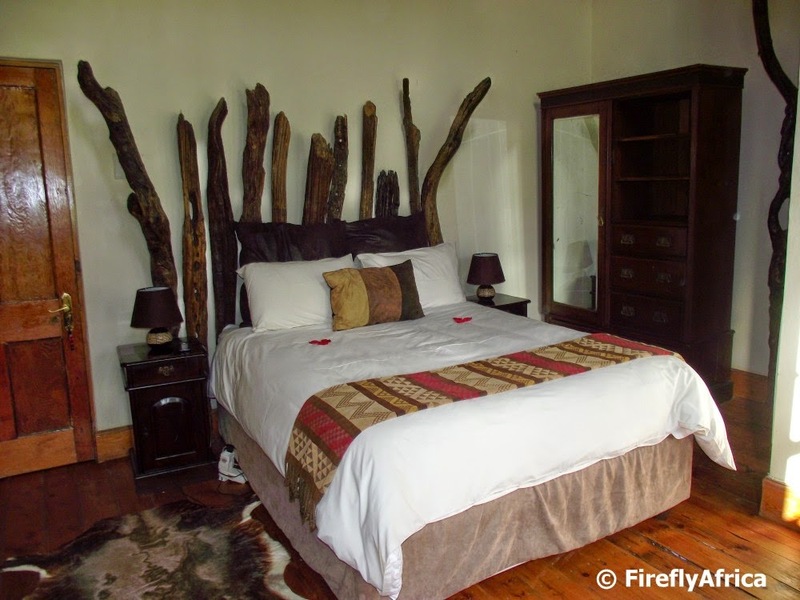 The hotel has 49 free-standing rooms and is laid out like a village with each cottage individually styled, themed and decorated to match specific colonial building styles found on the Garden Route. Facilities include the De Oude Martha Restaurant, the Hunters Pub and Cafe Bacchus. I prefer to have dinner in the Hunters Pub just because its a lot more cosy than the restaurant, but the food is great no matter where you eat. The hotel is also very centrally located allowing one to explore the village and surrounding forest on foot without having to take your car. I know I should try out some of the excellent guesthouses nearby, but I'm always drawn back to the hotel thanks to great hospitality by owners Chris and Irma. Plus they always invite me back so how can I say no? Eersterivier is one of the secret gems of the Tsitsikamma. The village is hidden away right on the coast close to Oudebosch Farmstall and consist of privately owned holiday homes. 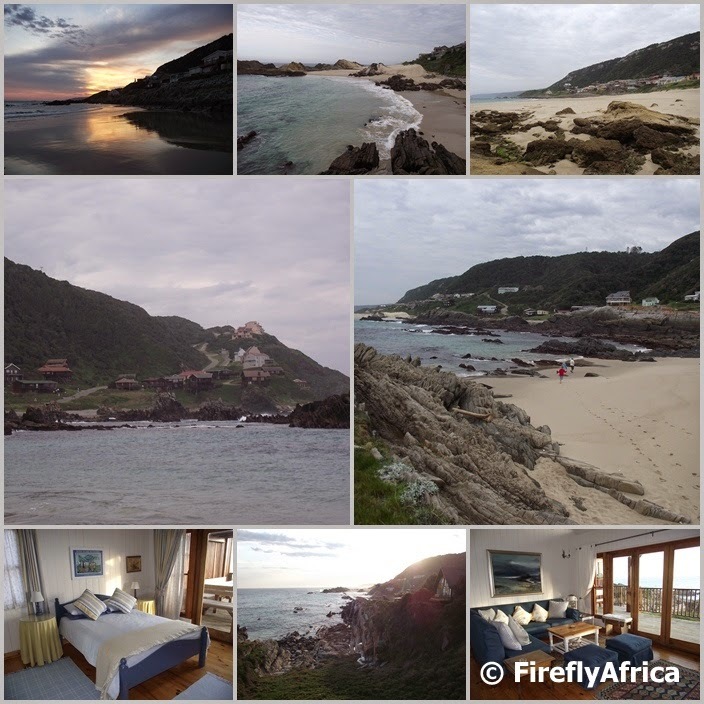 Accommodation at Eersterivier is on a self-catering basis in these holiday homes and can be booked through Tsitsikamma Seaside Accommodation. Eersterivier offers a serene seaside holiday experience. Days are spent on the beach, doing hikes along the coast or through the surrounding fynbos, doing shore based whale and dolphin watching or playing golf at the nearby Fynbos Golf Course. Either that or just grab a good book and enjoy the magnificent coastal views from the deck of your house. We spent a weekend Sho't Left in Eersterivier recently and the KidZ just loved the area. Sweet juicy red strawberries.... I don't need to use any more fancy words to get your mouth watering. Actually, you just need to have a look at the pictures in this post and not read anything at all. 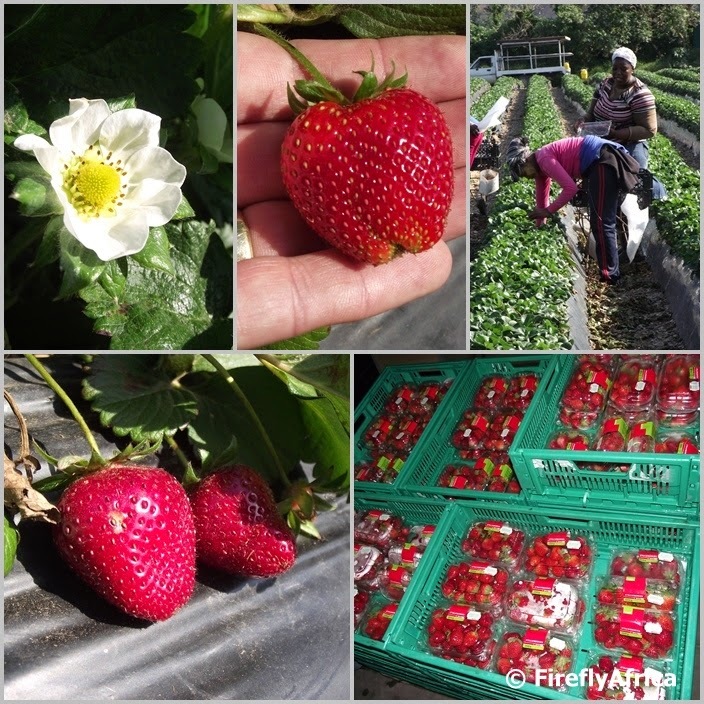 It's always great to get an exclusive behind the scenes look at something and in this case it was a tour around the Mooihoek Boerdery strawberry farm. 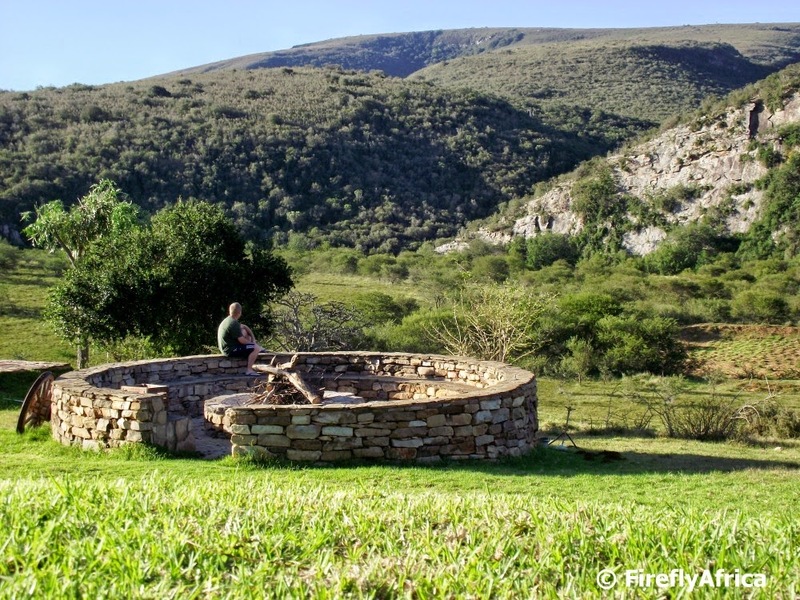 Mooihoek is situated next to the Gamtoos River outside the town of Hankey in the Eastern Cape. Back in 1998, farmers wife Madelé Ferreira planted 5 000 strawberry plants in her ailing rose garden. 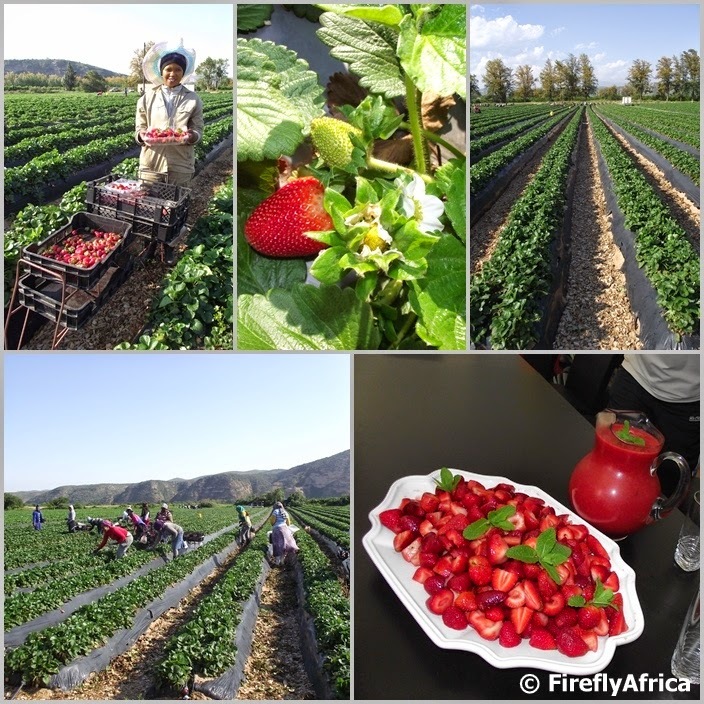 This has grown and developed to a farm with over 500 000 plants and employing 90 workers that supplies strawberries to chain stores like Spar, Pick ‘n Pay and Shoprite / Checkers. In 2012 Madelé was also named the Sanlam / Business Partners Entrepreneur of the Year: Job Creator of the Year, a huge achievement for this Gamtoos Valley farmer although she was very modest about it when I asked her. We were met by Madelé as we arrived at the farm and taken on a tour around the fields. Workers were busy picking strawberries and packaging them right there in the field to be shipped to a supermarket. The first thing I wanted to know was if I could try a strawberry straight off the field and as no harmful pesticides are used I could do it. "Just make sure you pick one on the shade side of the plant," was Madelé's advice. You don't want to eat a warm strawberry. After our walk through the fields we had a peek in the cold storeroom before heading to Madelé's boardroom where a jug of 100% strawberry juice and a some cut and chilled strawberries waited for us. This is going to spoil dinner, but who cares. I asked Madelé if they are open to the public to come and pick strawberries. Unfortunately at this stage they aren't. They produce strawberries all year around which means that they are always busy preparing and harvesting fields and until now there just hasn't been time to set up part of the farm for the public to visit. Not yet. So perhaps some time soon the Port Elizabeth folks would be able to go and pick their own strawberries less than an hour from home, just like you can do around George and Stellenbosch. Ok, so where can I go and get some strawberries to satisfy this watering mouth of mine now? 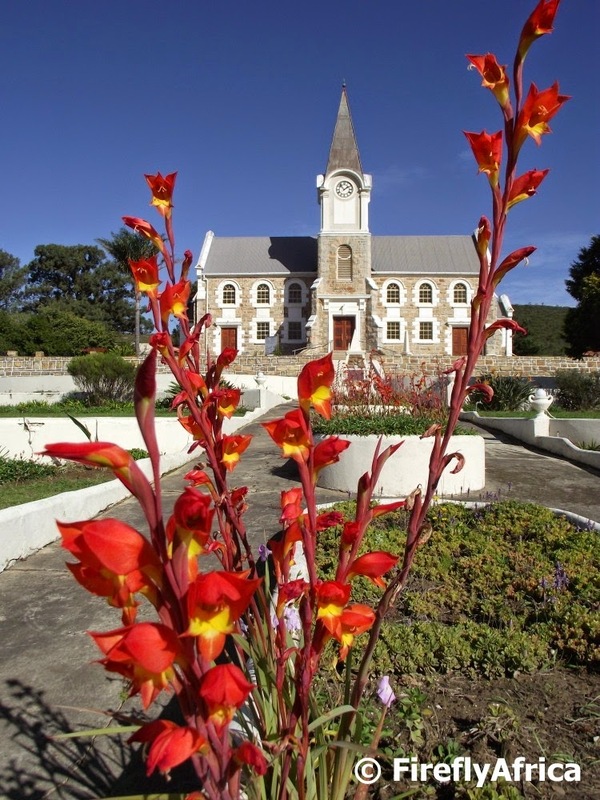 I love the bright red flowers vs blue sky colour contrasts in this photo I took of the historic Dutch Reformed Church in Kareedouw in the Langkloof. Just before peak season hit us I was on a social media workshop road trip in the Karoo and Addo areas. The night before the workshop in Addo I got to stay at Addo Palace in the Ndebele Private Reserve bordering the Addo Elephant National Park. It's always nice to stay and experience somewhere new and this was no different. 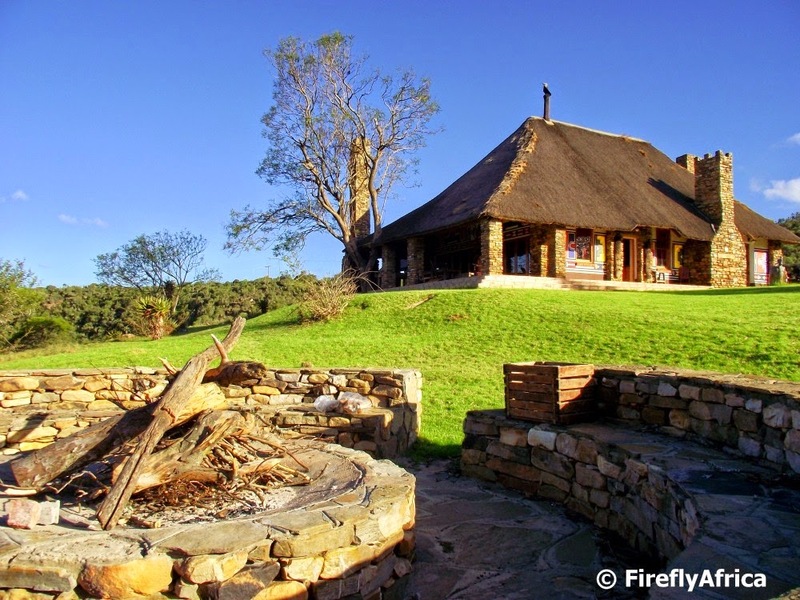 Ndebele Private Resevre is a 2500 acre game farm in the foothills of the Zuurberg Mountains and about 30 minutes from the Addo main camp. 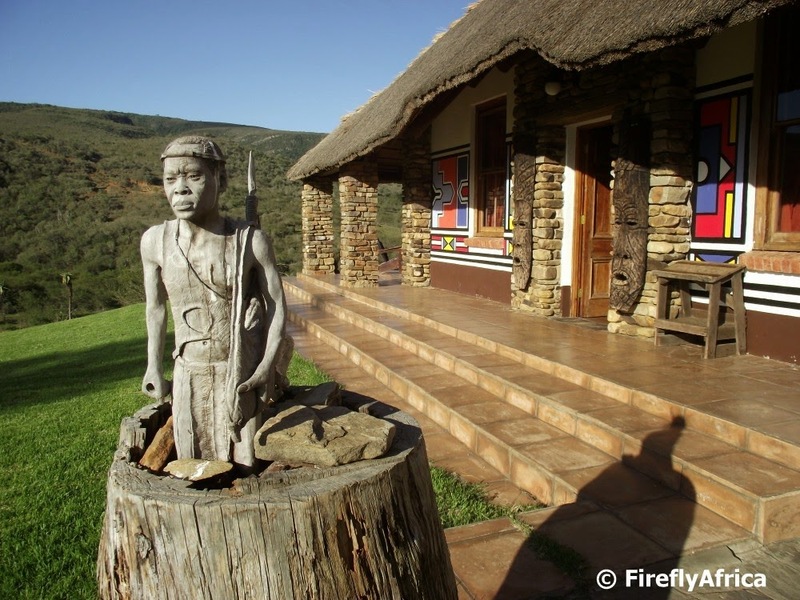 Addo Palace consist of three thatched buildings decorated with Ndebele patterns outside and an African theme inside. The main building, or Main Lodge, has five luxurious en-suit rooms and also accommodates the main lounge, dining room and kitchen. 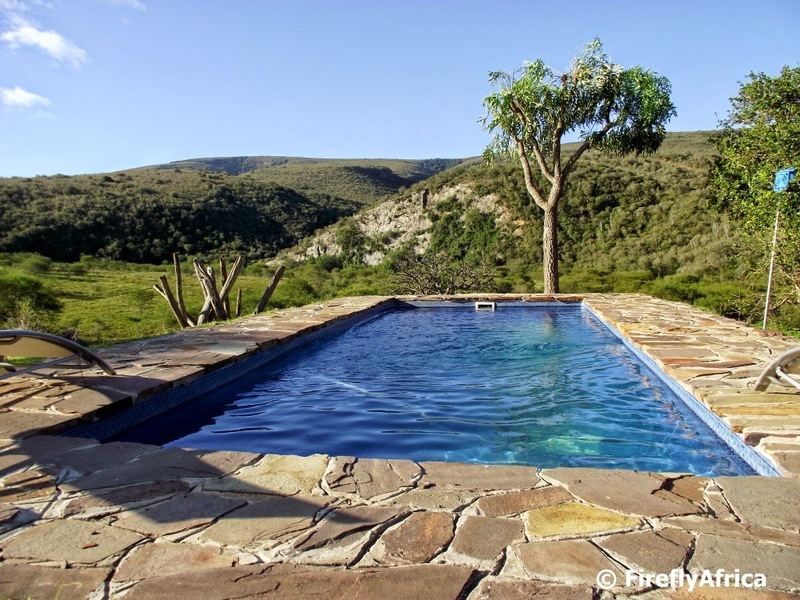 Kudu Lodge has another 3 suites with en-suite bathrooms and kitchens while the Zebra Lodge is a family unit that can be used on a full self catering basis if necessary. I stayed in one of the Main Lodge rooms with big spaces and high ceilings. I had the option of taking the room at the end of the passage with the veranda that has a view of the mountains, but I gave that up to my travelling companion. Darn! Addo Palace would have been the ideal spot to just chill for a couple of days, but the road back to civilization was waiting the next morning. Will have to make a plan to get back there some time. Disclosure: I spent the night as guest of Addo Palace - Ndebele Private Reserve but didn't receive any additional remuneration and retain full editorial control over my post. 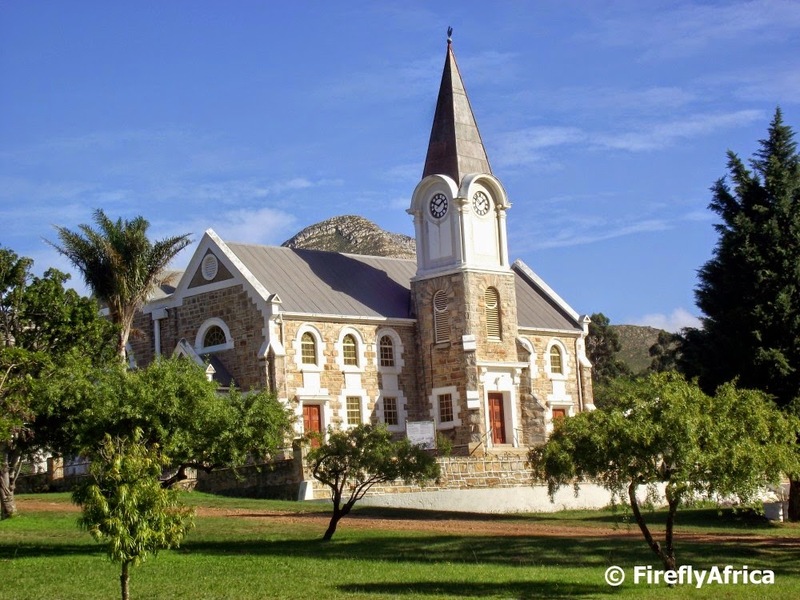 Kareedouw is the first town you encounter when you travel into the Langkloof on Route 62 from the Port Elizabeth side. 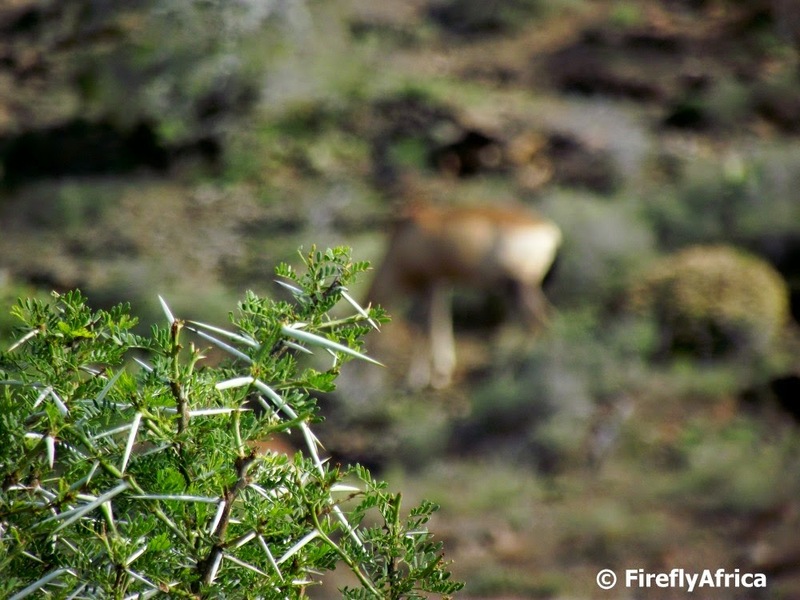 The name is thought to come from the KhoiSan word !karegadaob which means "A road past many Karee Trees". 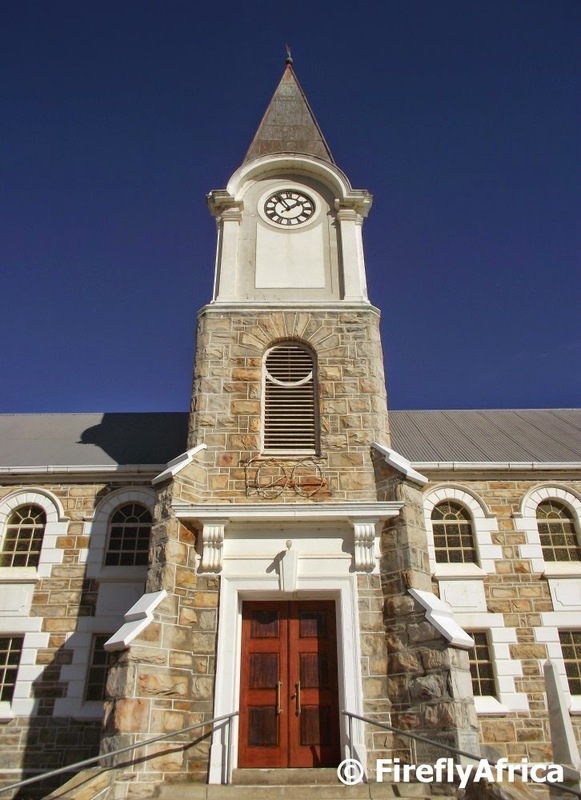 Kareedouw was established in 1905 as a Dutch Reformed Church congregation and I am assuming that is also the year that the church was built. If not then in the few years just after. I say assuming because I just can't seem to find any more information about the church on the internet. 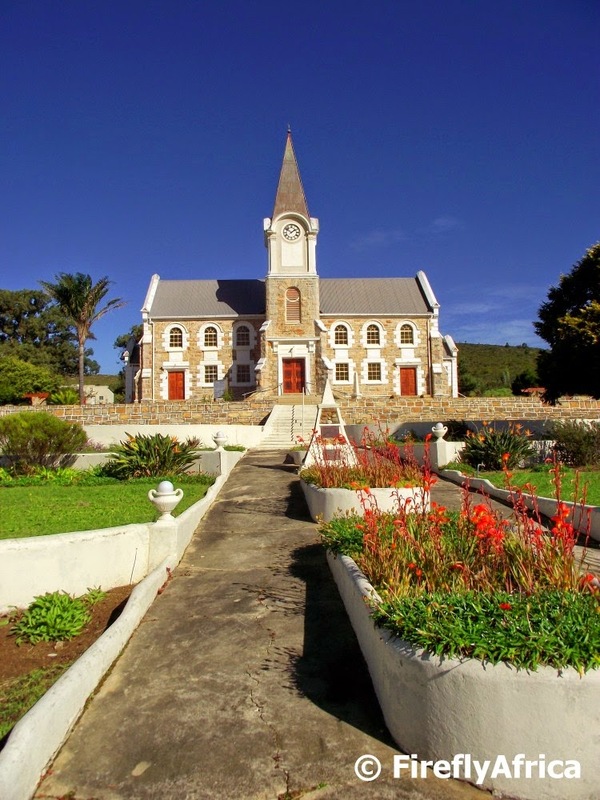 The church can be found on the southern side of town with the Tsitsikamma Mountains right behind it. 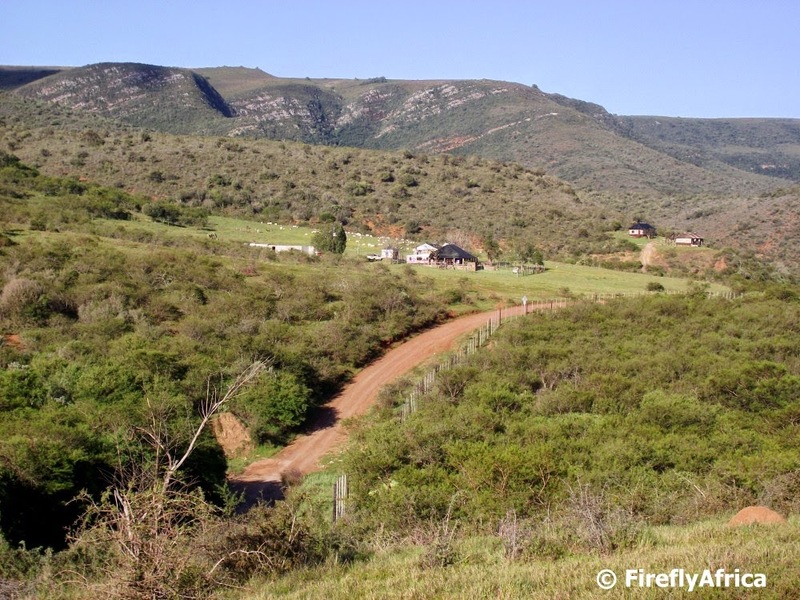 A small mountain pass just to the western side of town links the area with the Oudebosch area of the Tsitsikamma. Next to the church is a small "heroes' acre" where you will find the grave of Balthazar Johannes (John) Vorster, who was the prime minister of South Africa from 1966 to 1978. I wish I had more information about this beautiful church but my visit was a very quick one (just to find the Geocache next to the "heroes' acre") and I didn't have time to dig for information about it around town. Perhaps next time. Is it just me or did 2014 fly past at the speed of light. A year ago I had no idea what this year had in store for me and now, 12 months later I look back at a year of many highs but it also a couple of real lows, specially at the end. There is always more one would like to have been able to do, but 2014 has laid the foundation for 2015 to be an even more excellent year. The year started off on an absolute high when I landed the job of CEO of Emfuleni Corridor Tourism. After 6 years at Nelson Mandela Bay Tourism it was time for a change and ECTOUR offered me a big promotion from where I was and the opportunity to tackle more diverse challenges. In addition I get to promote the whole province and not just the city allowing me to truly be an ambassador for tourism in the whole of the Eastern Cape. It has also given me the opportunity to travel a bit more, not just around the beautiful Eastern Cape but also in South Africa. Can you hear me say roadtrip? In February I appeared in a Geocaching insert on Pasella on SABC 2 and in April I was named the 2013 Port Elizabeth Geocacher of the Year at the annual awards. I also ended up the year a lot lighter than I started it having lost nearly 20 kilograms in the second half of the year and in the process taking second place nationally in the annual Annique Slimming Challenge Competition. On the blogging and social media front I feel like its been a good year. Both my blogs are going well and I have been at it for over 6 years now. My Twitter following is just short of 2000 and I have finally gotten rid of the ol' Blackberry which means I am now on Instagram as well. During the year I was also privileged to be included on the TravelStart 100 Africa Travel Experts on Twitter and the Travel Opulent Box Twitter Top 99 to interact with lists. Attending Indaba, WTM and e-Tourism Africa Summit not only benefited me from a tourism point of view but also from a social media perspective and along the way I learned a lot and got to meet quite a few travel bloggers and influencers I have only known online up to then. On the down side I still struggle with being a blogger and influencer based in Port Elizabeth. Because I'm not in Cape Town of Jozi and don't get to attend events there I get very much forgotten by marketers and the like making use of bloggers in their campaigns. Meanwhile back at the ranch here in PE the tourism related marketers just don't seem to get the value of getting bloggers (and in particular this local blogger) involved in their campaigns. After a hectic year we were looking forward to two weeks away from everything in the Drakensberg when the Damselfly found out mid December that she had breast cancer. Since then she's been for a biopsy and surgery and the tests since then has come back negative so it seems they got it early. In the next week or two she'll go for a couple more tests but we are remaining positive that they got it all. If so then its just the corrective surgery and standard cancer treatment to come. Its at times like this you realise how many people out really care and the flood of prayers and good wishes was really overwhelming and I thank everybody for that. Now that leaves 2015. What will this year bring? After everything that has happened at the end of 2014 I have decided that I'm not going to casually sit back anymore. I'm going to do everything full out and stop putting things off for later or next month or next year. This goes for my family, work, hobbies, blogging, social media, Geocaching, whatever. Work wise its going to be busy year. I've been in my position for 11 months and now know what is expected of me. As soon as I'm back at work I'm getting my teeth into my planning and budgeting for the year and then its diving in head first. Social media wise I want to seriously put some effort into growing my profile as a blogger and travel influencer. So my new years resolutions are quite straight forward. Keep doing what I have been doing, just do it better. 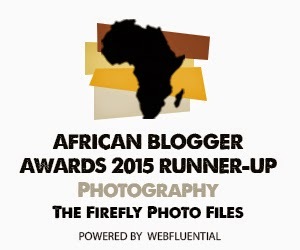 Wishing all the readers, followers and supporters of The Firefly Photo Files, Port Elizabeth Daily Photo and FireflyAfrica in general, a wonderful and prosperous 2015.